Yes, I know that William Gilpin, about whom I wrote in my last post, died before photography, though only just. He died in 1804 and, according to Wikipedia, the first permanent photograph produced by a camera was made in 1826. However, the notion of cameras – through the camera obscura – was already well known. This, however, is not really the subject of today’s post. The subject is the third essay in his Three essays, which is titled “On the art of sketching landscape”. may either be to fix them in your own memory – or to convey, in some degree, your ideas to others. Aren’t these our two main aims in taking travel photographs? That is, to help us remember our travel and/or to share out experiences with others? He then goes on to give advice about how to sketch, some of which is specifically about the tools and implements of sketching, but some of which relates more broadly to composing pictures. For example, he writes of getting “the best point of view” for the scene you wish to sketch (or, for us, to photograph), stating that “a few paces to the right, or left, make a great difference”. He’s right there. There are times when I’ve been too lazy, or felt I didn’t have enough time, to walk about looking for the best aspect, only to be sorry later when I’ve seen someone’s better photograph of the same scene. Today of course we can take panoramic photos, and we can enlarge (or crop) to our heart’s content when we download our images onto our computers. Still, the better the original photo, the easier later editing is, eh? His advice then starts to get more interesting, because he goes on to differentiate between making a sketch that “is intended merely to assist our own memory” and one “intended to convey, in some degree, our ideas to others“. These latter sketches, he says, “should be somewhat more adorned”. Now, part of this adornment is simply about the detail. A sketch to remind us of what we have seen may only require “a few rough strokes”, while one that is to convey something to others who have no idea of the place, needs “some composition … a degree of correctness and expression in the out-line – and some effect of light”. I take up a tree, and plant it there. I pare a knoll, or make an addition to it. I move a piece of paling – a cottage – a wall – or any removable object, which I dislike. He qualifies this, though, by saying that “liberties … with the truth must be taken with caution”. We should not, he says, introduce “what does not exist” but can make “those simple variations … which time itself is continually making”. All this made me think of photography, digital in particular, and how easy it is to remove or modify or manipulate an image to make it look better … and made me realise that no matter what tools we have to hand, this is something we have always liked to do. And this is the point that Gilpin is making with his theory of “the picturesque” because, if you remember the definition I gave in my previous post, it is about “that peculiar kind of beauty, which is agreeable in a picture”. What I take away from all this – ignoring Gilpin’s tendency to pomposity and prescription, for which he was, fairly I think, satirised – is that he is talking about the difference between “reality”, or what is actually there, and an aesthetic “truth” relating to the ideas (and even feelings*) conveyed by the scene. And that makes sense to me. 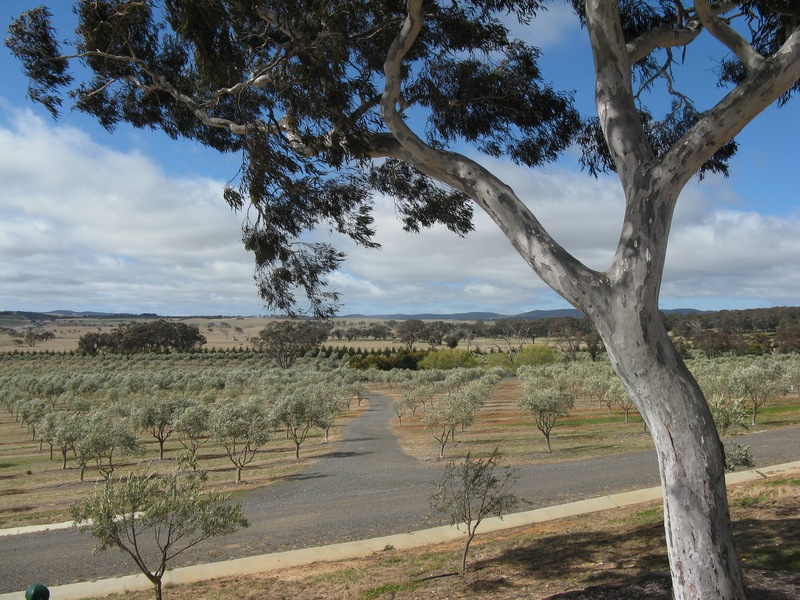 Gilpin would not like the rows of olive trees here, but would probably like the irregular somewhat rough tree. * There is, I believe, much academic debate about whether Romanticism rejected or extended the ideas of the Picturesque. I’m inclined to think it’s not a case of either/or but a more complex development. Staying with Hannah, she was working on an assessment piece about taking three separate photos and cropping them together, digitally, into one. It kind of… upset me. I don’t like to think of an image that I, the viewer, would immediately think of as depicting reality, as being completely false. Anyway, that’s what I thought of, here, when Gilpin talked about being careful taking liberties with truth. It plays with the mind … And yet, if it had been a painting she was doing would you have felt differently? We have fiction and nonfiction writing, with blurred edges. I guess we can have fiction and nonfiction photography? Photographs that have been manipulated, photos that have been set up/staged … Where is the truth, let alone the reality? WOAH YOU JUST BLEW MY MIND THERE WITH YOUR CRAZY TALK MAMA. Glad that I can still be crazy at my age, daughter! Before I ran away with my arty-farty ideas, I began a course in visual communication at Sydney College of the Arts. I still use much of what I learnt there with the little graphic design that I do. I think there is so much one can learn about the eye, vision and composition versus the ‘truth’. I later ended up living five years with a photographer and learning much more – artistic truths mostly! – and while I think theory can help produce a great shot, ‘the eye’ can grasp these elements in a flash – lighting, tone, composition. That is why I’m not distrustful of digital photography (because it is here to stay) but I love the great old photographers – Kertesz, Adams, Modotti. Having said that Photoshop is fab! Foot in both camps eh, Catherine! We have a lovely Adams print here that we bought from the gallery in Yosemite. It’s special. Interesting about the eye versus the lens isn’t it? Any special artistic truths you’d like to share?! Very interesting. I like how you connected his ideas to photography. You know, in spite of all the things you can do with digital photos these days, my husband still can’t take a picture worth a hill of beans. It really is astonishing how bad at photography he is. That’s pretty funny Stefanie … Still it’s not good to be perfect! There’s his little imperfection!